Thanks for visiting Healthful Mama today! If you Subscribe to HealthfulMama by Email, I’ll send you my Good Choice Shopping List to help you stay on track with healthful eating. Enjoy! I stumbled upon Andrew Wilder’s site Eating Rules by recommendation of a friend. (And then had one of those blogger moments when you realize you’ve been a bit too focused on your own stuff to notice WHAT’S OUT THERE–holy wow.) How did I not know this guy existed? I have a new blog crush. He’s just so…Right On. And in being “right on,” Andrew has instituted the second-annual October Unprocessed, a public challenge to go an entire month without eating any processed foods. And so, that’s the challenge, then, isn’t it? Unprocessed food is any food that could be made by a person with reasonable skill in a home kitchen with readily available, whole-food ingredients. This means no white flour; no white sugar; no processed snack foods (Put that cookie down! ); no fast food (you know who you are). It also means you should eliminate microwaveable meals, frozen, packaged dinners, protein bars/drinks/shakes, most cereals, pastas, and the like. So, for some, this is kickin’ it old skool. Before I have you envisioning yourself dusted with flour, slaving over a hot oven donning your grandmother’s apron, let me remind you WHY you should consider this: it’s for your health. It’s for your kids’ health. It’s for LIFE. This isn’t some crunchy-brained, granola-freak’s placard demonstration, this is an example you can set for your kids and those around you. Think about it: if you and your children realized you could get away with making your own meals and snacks, versus depending on a company to do it for you, well, now I say that’s empowerment. 1. Sign the pledge. You don’t even need to commit to a month, but make a commitment. 2. Make a menu plan. (Start out easy on yourself. Make and freeze some whole grains in advance.) 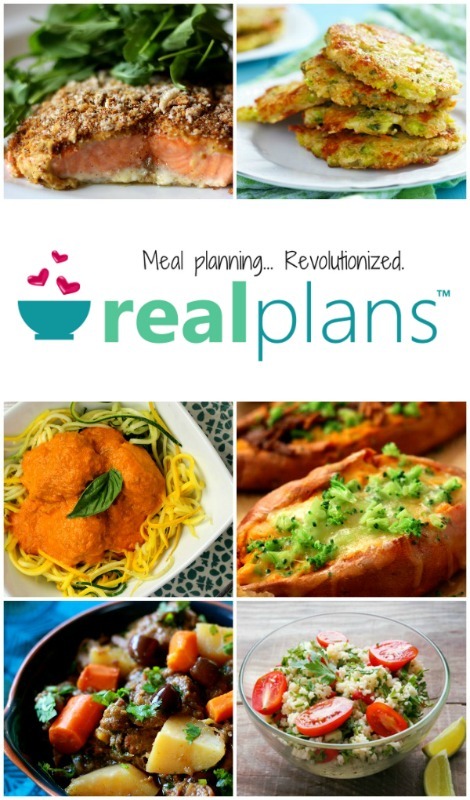 If you still need some ideas, check out Aimee’s simple menu ideas at Simple Bites (another holy-wow kinda site). 3. Talk about it. 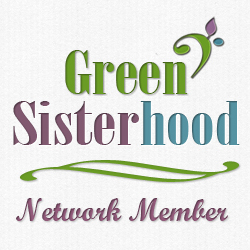 If you blog, blog about it and add the badge to your site. 4. Follow the #UnProcessed hashtag on Twitter. 5. Tell me about your venture! Leave a comment or shoot me an email. I love hearing about changes people are making! 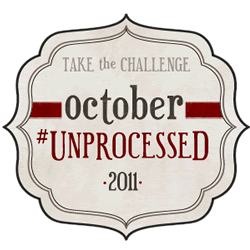 So, will you take the October Unprocessed pledge? I’m doing it! We are making a few exceptions (for my husband, who is lactose intolerant) but other than that, I’m going to try to go completely non-processed (by his definition) for a week, and the rest of the month, I may add in pasta. Which, however, I’m not sure where it stands by his definition. I can, and have, made pasta in my house, and if it’s whole wheat pasta… I have yet to check what the ingredients are in it. Also – something I found interesting, he does allow healthier, more whole-foods granola bars, etc. For example – he mentioned some commercially made bar whose ingredients were whole oats, raisins, etc – nothing that one couldn’t procure and make at home – no white flour, HFC’s, etc, and that was deemed a-ok.
I’m excited to do this – I feel like we eat a lot of unprocessed items already, but it will be good to see if we can truly go 100%. That said, I’m going to miss my white sugar! Krista, thanks for the comment! I think it’s awesome that you’re going to give it a go. I think you’ll find that it’s easier than you think! I’m worried about the no-pasta thing. I wonder if you can freeze homemade pasta. . .
Sarah, have you made pasta before? I’ve never tried it. I think I’ll just be eating whole grains instead. This sounds amazing! I wish I had the time to do this… I will definitely be keeping up on your efforts! 🙂 Good luck! Come cook for me and I’m in. 😉 Seriously, I’m going to push myself to not fall into a crappy food rut just because I’m back to work. I *will* take a lot of planning, Lisa! Rethinking the way we do things, for sure, and rewiring the brain.